Headlines » Nature » C.A.T.C.H. On the 16th of May C.A.T.C.H. (Community Action to Transform the Cale Habitat) – Wincanton's home-grown group of nature conservation heroes (many of whom literally grew here) – kicked off its efforts for 2014 with a fantastic activity for kids, aimed at making them more aware of the river and its wildlife in the hope they too will grow into responsible adults with a deeper respect for nature. Back in February 2013 a representative of the Wild Trout Trust (WTT) joined C.A.T.C.H. on a walk of the Wincanton stretch of the Cale (watch a full video of the survey here), and produced a formal report on its state of health and what could be done to improve it. Mayfly in the Classroom was suggested as a means to engage the community, and a few months later another WTT rep appeared to make it happen. Unfortunately we weren't able to cover it in detail that time, but this year C.A.T.C.H. arranged a second session in conjunction with Horsington Primary School and a special effort was made to document it. The resulting video is another 30-minute episode, but the wonder that is technology today allows you to jump to any part of the video instantly, so it seemed unnecessary to cut bits out that might be useful in certain situations. Use the timestamps above to jump to the bits that interest you the most. A sizable group of children, 25 or so, was walked down to the river bank near the skate park opposite Morrisons. 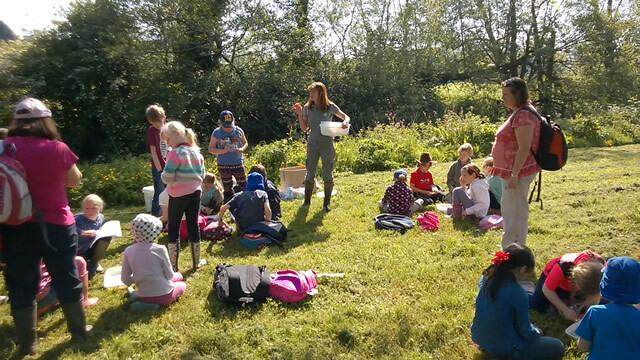 Sue Scott, talented WTT rep and former teacher, went down into the river with a net and a tub and took some kick-samples of the insects hiding on and beneath the river bed. 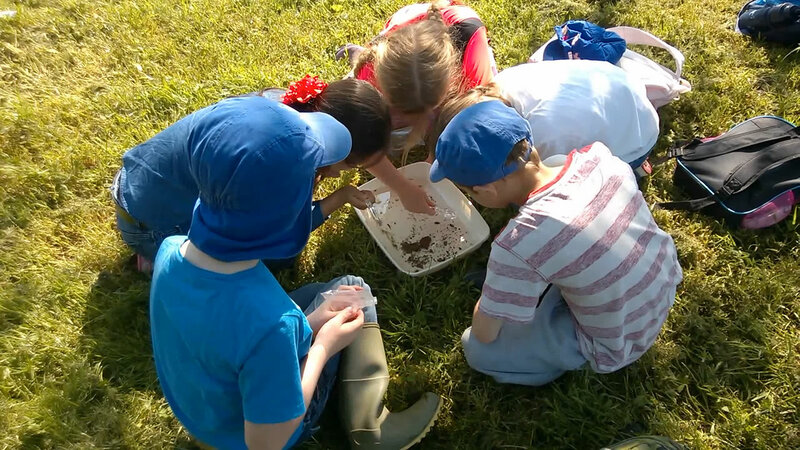 Equipped with trays, magnifying glasses (not for fire-starting) and an information sheet detailing the various species to be expected, the children attempted to identify what had been collected. The goal of the exercise: to separate 6 or 7 unhatched Mayfly eggs to be taken back to the school where aquaria would be constructed out of plastic bottles, some rubber tubing and an electric air pump. The WTT provides a complete pack of all the equipment a school needs to host their own Mayfly in the Classroom. Sue's time came for free, so the only cost involved was that of the pack which includes the 100% recyclable aquaria parts. 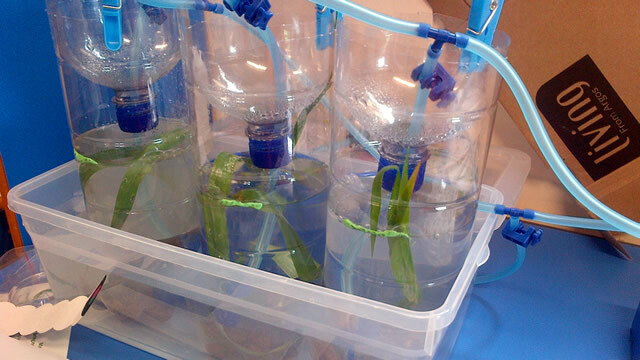 Samples of the river bed, water and foliage were added to the aquaria to provide an environment appropriate for the hatching of the eggs. Once hatched, the children would return the Mayflies to the river to live out their single day of adulthood and produce the next generation. Eggs most likely to hatch during the following school week were selected, to maximise the chance that the children would witness the hatching and be able to return the flies to the river themselves. Horsington Primary School has a stream running through its grounds which eventually joins the Cale; a convenient drop-off point. Unfortunately only one of the eggs hatched during school time before half-term began, but the children were able to return it to the river that day as planned. With several unhatched eggs remaining it would be impossible to leave them for the duration of half-term. If they hatched unobserved they'd die in the aquaria, so Gary Hunt, Chairman of C.A.T.C.H. and his daughter Sophie (the one with the C.A.T.C.H. branded hi-vis jacket in the video) volunteered to take the aquaria home and ensure the rest of the flies would be returned to the Cale upon their hatching. Mayfly in the Classroom became Mayfly in the Kitchen (© Gary), but at least all the kids were able to see the whole process through and witness the hatching and releasing of one of the Cale's most important, and interesting species. In the video Gary invites everybody, young and old to get involved with C.A.T.C.H. 's scheduled riverside litter-picking events. The next one will be the first of 2014 and will take place on the 6th of July. It's a very sociable opportunity to get out in the fresh air and achieve that warm fuzzy feeling for having helped Mother Nature out a bit. There will likely be details to follow, so keep an eye on the site during the coming weeks.